no, i'm not going to quit blogging. but it's high time i gave up cigarettes. i never planned to still be smoking into my 30s. now that i'm 31, that means it's time to get serious about kicking the habit. 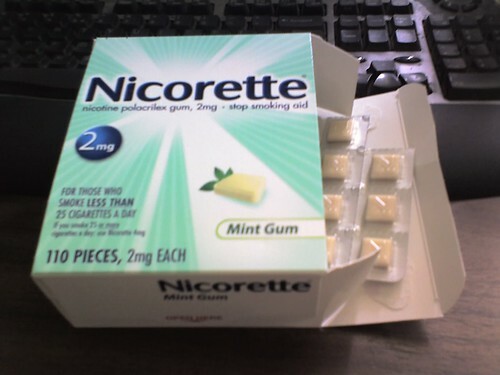 i'd already done what i could to cut way back—for several weeks, i've been down to about 5 or 6 cigarettes a day—so last night i took the next step and bought a box of nicorette (chosen because i can control my dosage better than i could with, say, the nicotine patch). if things go well, i'll never smoke another cig again. Not an endorsement, but as it happens, I was reading a Men's Health magazine today -- it's not Dostoyevsky, but it's a guilty pleasure -- anyway, one of their squibs mentioned that folks who had friends send them messages a few times per day encouraging them on their effort to quit enjoyed a noticeably higher rate of success. Just, for what it's worth. dad hated the gum too but eventually he quit. I'm proud of you! I'm sure virago is pretty happy too. having been there not too long ago, i realize that a 100+ piece box of nicotine gum is a big investment, but fwiw nicorette fruit chill is actually pretty tasty. for nicotine gum, that is. it helped me. the mint flavor tastes just fine... for the first 15 minutes. it's just the last 10 minutes or so, after the flavor has been sucked away and just the nicotine remains, that's kind of gross. another blog dies... who will be next?